I'm a huge fan of the Salvatore books and D&D lore in general, and have always wished that I could actually make a Aasimar, Tiefling, Duergar or a Drow (chief among my wishlist, as to be expected). Maybe even one of the deep gnomes. Have them start with different starting stats or different racials (Drow shouldn't have + to hit with bows, but to crossbows, have different mage specializations available, be restricted on character coloration, ect). Is it just very difficult to mod a new race into the game, or is there simply not a demand for it? 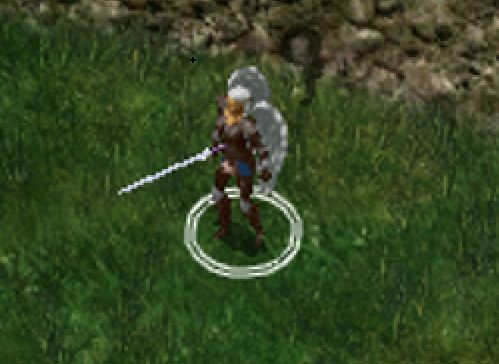 I haven't been able to find one at all, other than an apparently unbalanced subrace mod for BG2. Adding new races, especially drow, is a pretty common request. If there aren't already mods like this existing, I'd assume there's some barrier to doing so. But hopefully someone who knows more about modding than me will be able to give you a better answer. It really isn't as hard as one might think. I just did a run through with an Aasimar Cavalier that was very fulfilling (added the wings and all for fun). My approach is to not try and make the character creation menu adapt to me, but instead, just equip an item that alters the stats as per the race. Attached is an Aasimar ring that you can CLUAConsole in, and add to your character that imparts all the benefits, as well as the drawbacks (xp penalty), of being said race. 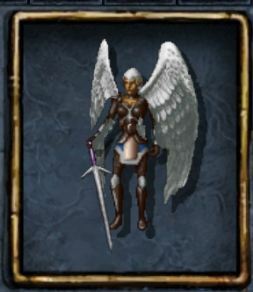 BTW: this Aasimar is well equipped (end game) for these Screenshots. If you want a ring of race "X", just let me know and I will make you one. Introducing the Drowbans! Improved eyewear for those normally inflicted with blindness in the light, these dark spectacles are so cool you'll want to even wear them at night! I didn't write an installer or details. It's just the ITM file, drop it into your Override and CLUAConsole it in, and viola, you're a Drow. (Oh I cursed them too ... they're yours for life!). OK ... here is another one I made awhile back for my Svirfneblin Monk run through. "Ring of the Smurf". The 33% exp penalty really hurts, but all-in-all a fun character to play. If you want to play it as a monk. Just make a Human Monk and put the ring on and now you are a Gnome Monk (Smurf). The animation will not have the kick routine, but it works otherwise. Monk MR wil stack with Race MR.
Again no script, or installer, just unrar and drop into your Override, then CLUAConsole it in. That is truly amazing and thank you for the help! I haven't a clue what CLUAConsole is, but I'm sure a quick forum search will give me the info. A great workaround! @corsymyr how about a 'trainer' NPC that will sell you these items for 1gp in Winthrop's inn? I can see it already! Corsymyr's race pack. People will 'race' (wink) to install it. How you added wings to Aasimar? The wings are an aspect of the 1PP mod that was integrated into BG:EE, so I assume it works by hoisting them from the depths of whatever file they're in. Corsymyr, that is awesome! Would you be able to make rings that let me play as Githyanki, Drow, and Hobgoblins? Maybe Orcs / Orogs (Underdark equivalent of orcs, similar to how drow are underdark elves), and Ogrillons? I also agree with mars0124, having a "race pack" mod would be a great idea (especially for those, like me, who don't yet know how to use CLUAConsole commands). Keep up the good work! You can learn all about the mysteries of CLUA here. Thanks Cerevant! I'd still be interested in rings that turn you into githyanki, drow, hobgoblins, etc. Nice work indeed, @Corsymyr, but maybe you should specify that these are more like 3rd edition conversions of these races to baldur's gate rather than 2nd edition srd races (for those purists out there ). It would also be quite simple to modify those ones to more like 2nd edition races by halving the penalties and bonuses as 3rd edition uses +2 bonus as a minimum racial bonus and 2nd edition +1. Don't know about the rest of the abilities since I don't own any 2nd edition books myself, maybe someone who does could give more specific info on them, if there is any. These are the subraces I had info on. @DraconisPrime feel free to send me the 2nd edition version of the race you want, and I will see if I can't add it to the kit. @Corsymyr istead of asking for itens of specific race X could i ask you a related requests? Can you hard code this feature in dual class? Only humans use dual class, it's an dead piece of the engine therefore for any non-human. Could you use the dual-class feature to give the player an option to dual class his race, a dual-race to be more specific ? Trying to work the idea based on infinite engine possibilities. If you or someone could invert the dual-class restriction in those matters, so instead of being unable to dual-race at level 1, you could only dual-race IN level 1. I'm asking this cos i think that create extra race kinds in the character creation is impossible (from what i saw), if it's possible, just ignore my request. what is the CLUA command to get the 'bans in? 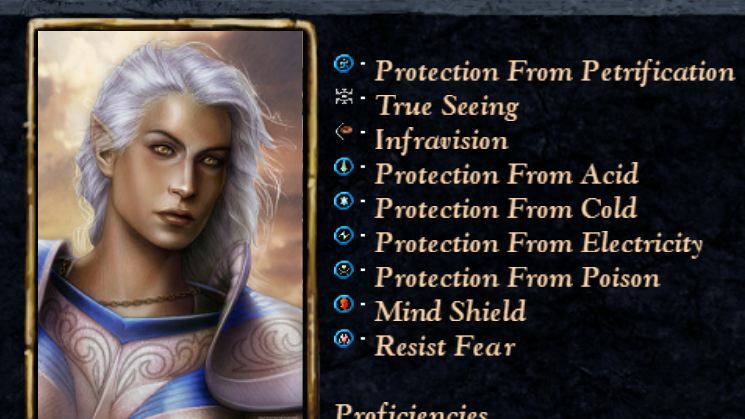 Will the Drow goggles work with BG2EE and are they invisible? I'm feeling lazy: do these mod have gensai (particularly, air) included? Sorry for the lazy of not testing myself. I am seriusly considering spending 25$ in the game for Mac, solely for cluaconsoling this and exporting the save to my ipad game (no, I can't and won't actually play in Mac, just iPad). Before spending my money, will this work? Will also surely work EEKeepering it before exporting my save back to iPad? Any chance to mod a save in Mac and deliver the save to iPad and succeed? Please i wanna know this before I spend my money. They can add whatever they want too the games i want too be a minotaur or even a centaur, it could be abit difficult too add it as a race but the devs could just add a ring of the maze "my made up ring" and it turns you in too a minotaur giving you 25 based strength and 20 based constitution -5 wisdom wear of this ring may not equip helmets and suffers a ×4 with critical damage and changes the wears aliment too true neutral and is a cursed item. Charged Abilities: Charge attack - 2xs a day Rage - 3xs a day Berserk 1x a day Bash 1x aday and so on whatever a Minotaur dose and can do.